Here at fordogtrainers-asia.com, your satisfaction is very important to us. We know that you, pet parents, are busy. So we've made our Return Policy easy and convenient for you. All items (except for custom orders) are returnable within 21 days after delivery. When returning goods, shipping and a 10% restocking fee are at your own expense. In case it was our fault, we will make everything right at our expenses. be received at our location within 21 days after delivery. To be eligible for a refund, item(s) must be clean and free of dog hair. If the item(s) has(ve) been tried on and contains dog hair, all dog hair must be removed. Free shipped items, bite sleeves and other heavy weight items (bite suits, bite jackets, jumps, etc.) are subject to a $25 fee or more per each item when returned. Item(s) returned after 21 days will be donated to our local rescue program. We will donate the item(s) to our local rescue program on your behalf, thus you will be helping dogs that are less fortunate. Please note that you will not receive any credit for these returns. How do you return items? Do not ship any items back until you receive a return/exchange authorization number. If you need to return/exchange multiple items simply repeat these steps for each item. If you do not receive any reply from us within 1 business day, please, check your spam/junk box or email us again. If you have any questions, please click here. We recommend to pack your return(s) carefully and insure it with the shipping company to avoid liability in case the item(s) is(are) damaged in transit. provide us with the explanation of how your order has been damaged and attach pictures of damaged item(s). a photo(s) of the item(s) received. 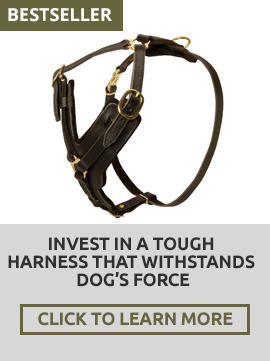 attach photos of your dog wearing the muzzle: front and profile. a photo of the unfastened collar lying flat on a hard surface (table, floor, etc.) 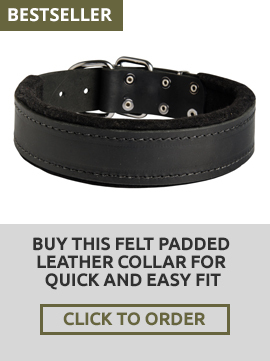 with a ruler or tape measure along the length of the collar. 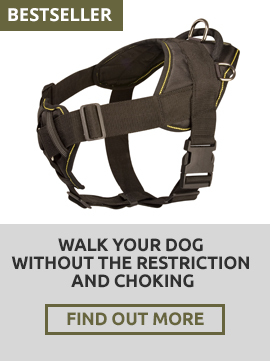 photos of your dog with the harness on: front and profile. How do you get your money back? Once we receive your return, we inspect your item(s) and then initiate a refund. We will notify you via email when your return has been processed. If you paid by PayPal, we will refund your PayPal account. Orders outside of the U.S. may be subject to import taxes, customs duties and fees, levied by the destination country ("Import Fees"). Additional charges for customs clearance must be borne by the recipient. We have no control over these charges and cannot predict what they may be. Customs policies vary widely from country to country; you should contact your local customs office for further information. When customs clearance procedures are required, it can cause delays beyond our original delivery estimates.